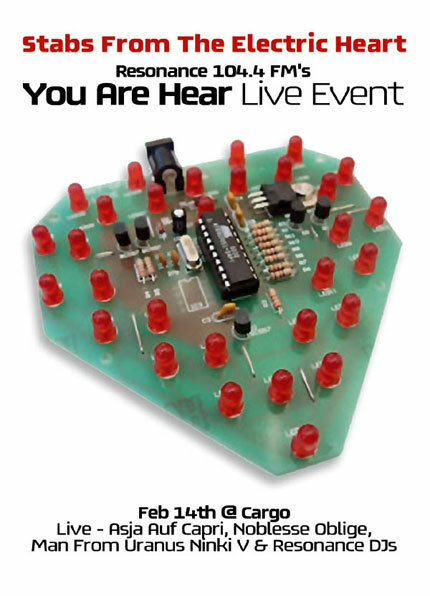 Circle of Sound explores the relationship between the affective spaces and transpersonal intensities opened out by sonic practices, while addressing the function and circulation of sound art / experimental music as a commodity. Connecting the disparate works, the CIRCLE is ever significant: the spooling tape-head; the ceaseless accumulation of inconsequential data; the shiny, impermeable CD surface; the fictive smooth-spaces of multinational capital; the spiral groove of the record; the dialectic of cyclical repetition and teleological progression; the self-devouring Ourobouros; the return of the repressed; the regenerating ecosystem; the ecological imperative to recycle. 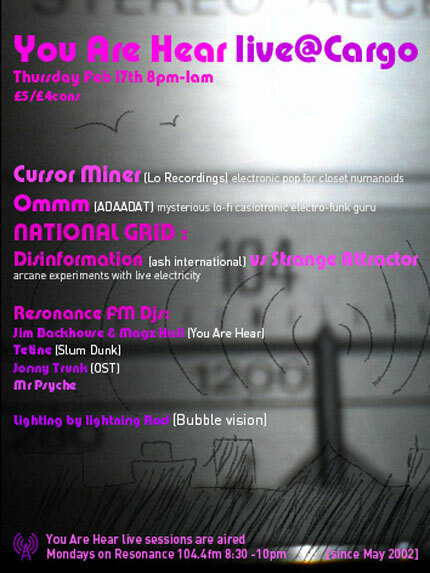 The sounds of the crackling ether inform several of the artists involved such as Disinformation' use of VLF to tune into the imperceptible rumblings of the magnetosphere. Many of the works explore the spectral mulitplicity of histories and processes which emerge from the recycled object; other works explore the resonant frequencies of the voice, the soundscaping the city through found sonic-objects; sound, memory and the domestic interior and dada-montage-seaside bonhomie. 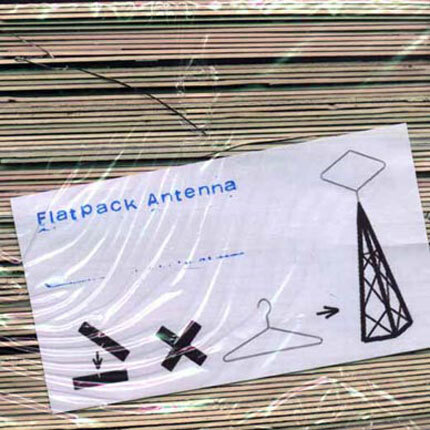 Flat Pack Antenna is the Resonance FM Fundraising LP organised by Magz and Jim. Huge thanks to every one who responded to our call for tracks. We had an excellent response with 29 tracks submitted. Raising over £5000 for Resonance! It's a limited edition vinyl LP, only 500 copies. The launch party at the Foundry was most excellent big thanks to Benge, Salt Pervert , Jonny Trunk, huge respect to Roderick for the way out lightshow, Jason Synott for the amazing rotating dance floor record sculpture and Chris, Tim, Andy and Jonathan for helping out. Also thanks to every one for coming down and making it a real happening. For credit card purchases and full information visit post everything or no immortal Less than 50 left - grab one while you can! Thanks to every one who supported these events.